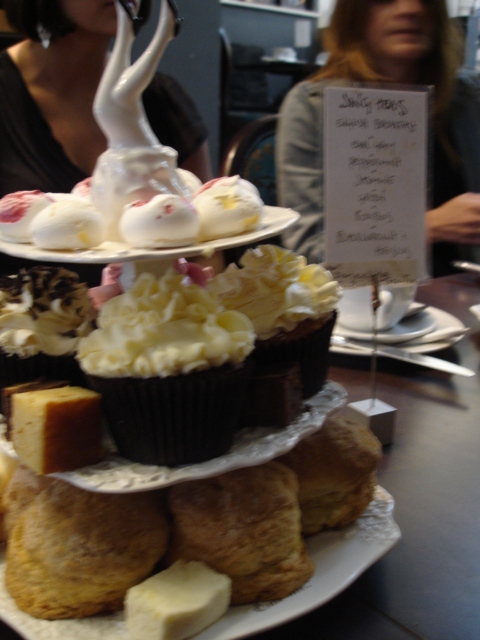 Since when did cupcakes and afternoon tea become so trendy? 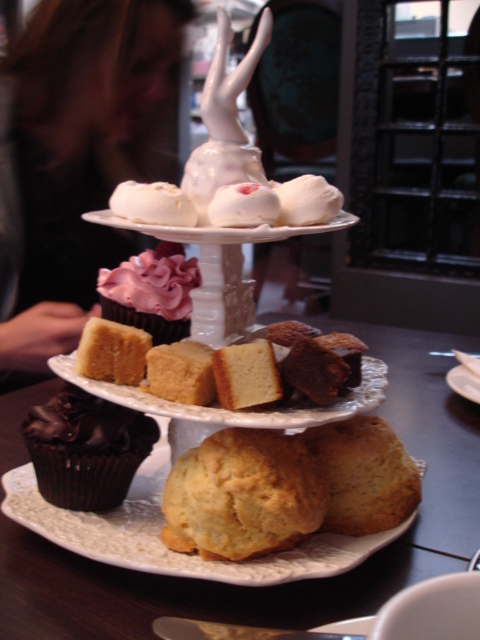 My earliest experience of afternoon tea was at the Edinburgh zoo tea room and Bettys in Harrogate – all scones, doilies and blue rinses; and not a single skinny jean in sight. However, like the denim shirt, what was once considered naff can become high fashion, and in London cupcakes and tea are like soooo hot right now. I recently loved afternoon tea at the Wolseley, and at the Bath Spa; and I’d love to try it at the Ritz, the Dorchester and Fortnum & Mason. 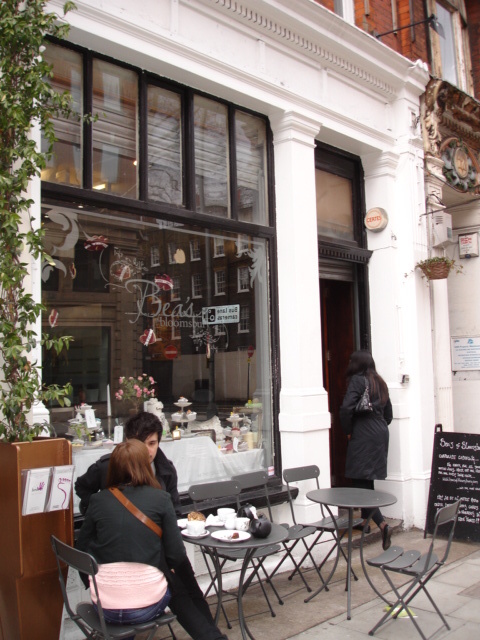 But a little less Miss Marple, and easier on the wallet, is Bea’s of Bloomsbury, half way between Holborn and Chancery Lane. I have to say I have a savoury rather than a sweet tooth. Like Joey from Friends, the sandwich is probably my favourite food group, and I’d take a cheese board over pudding any day. That’s not to say I don’t like chocolate – far from it, especially at 4pm during my working week – but I don’t tend to crave sweet things. However, walking into Bea’s, you can’t fail to notice how pretty everything looks. 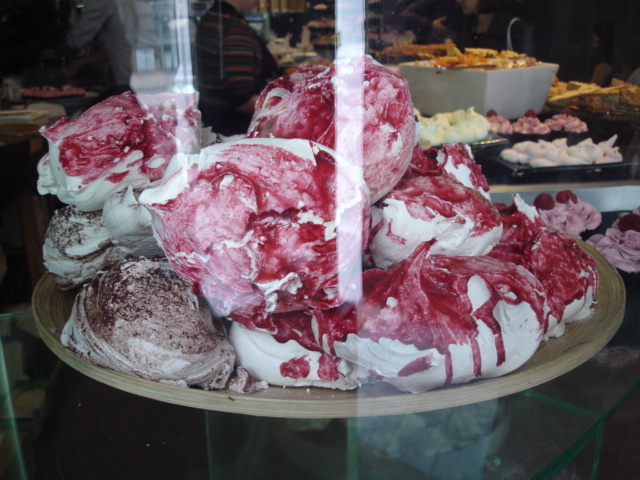 Pink swirly cupcakes, huge plates of giant macaroons and meringues, sweets, biscuits. 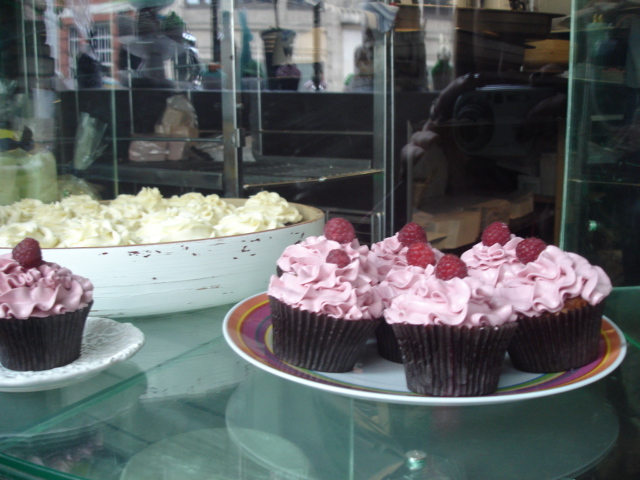 Sugar heaven but not at all twee – there’s no pink china or doilies (shame actually!). We sat down and ordered cute little pots of tea and tiered treats. Starting from the bottom, the trays were filled with delicious scones (served with clotted cream and jam), marshmallows, tiny brownies and shortbread, then up to wildly adorned cupcakes (LOVED the be-glittered ones!) and macaroons. The scones were lovely – perfect with jam and tea – and the cupcakes were amazingly soft and moist and incredibly sickly sweet and covered in gloops of sugary icing but still yum yum yum. As I said, my fantasty-island tier would include little cucumber and cheese sandwiches, but this was bloody good. Not used to sweet things, and seemingly born with an inability to stop eating when full, I managed to leave feeling a little sick from the sugar rush, which left me slumped in my chair with only the promise of impending white wine to wake me up. I think I’ve read somewhere about poor service and I have to say the staff weren’t the friendliest I’ve ever met, but nothing outrageous, and sadly in London trendy venues can be the victims of their own popularity and forget to treat customers like kings and queens (as they always do at somewhere like the Wolseley). 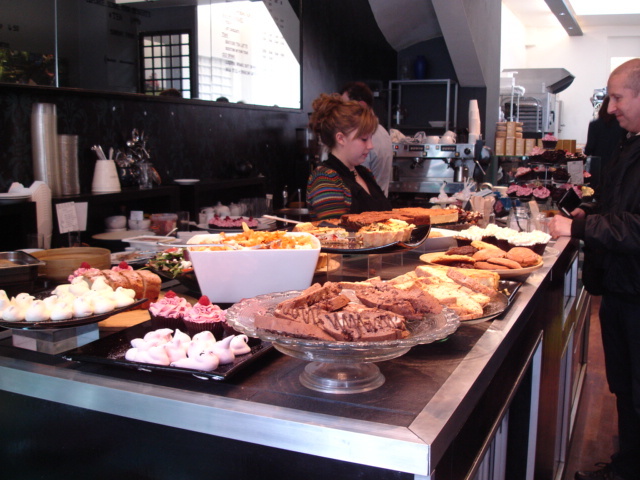 Although the food is a treat so the service should be the same really. 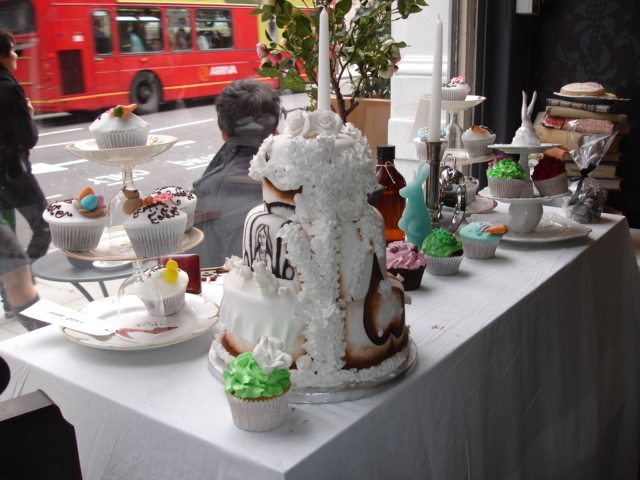 It wouldn’t put me off going back though – it is the PERFECT place to take your sweet-toothed friends, or your mum, or visitors to London who haven’t realised that tea and cupcakes are trendy again, an alternative date venue, and a gluttonous alternative to wine-filled sessions with girlfriends.